Shatare Lewis began her career with CoreCivic in 2015 as a client monitor before she was promoted to her current position as resident monitor at Oklahoma City Transitional Center. 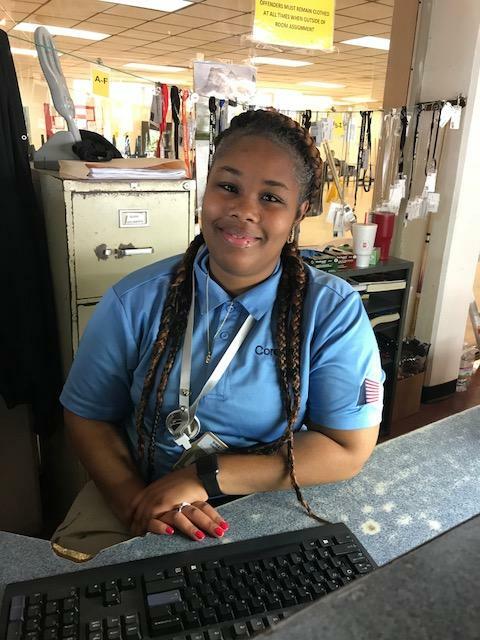 In addition to her full-time job, Lewis attends Rose State College, where she will graduate in 2020 with her bachelor's degree in criminal justice. The responsibility of keeping the employees and residents safe within the facility is what I enjoy most, but I also enjoy the everyday learning experience. My job teaches me more than my textbooks, and hands-on learning like this will really help me to develop in my career. What has been your proudest moment with the company? I am proudest of being featured during National Correctional Officer and Employees Week because it shows me that the hard work and dedication of CoreCivic's employees is valued. This nomination is an encouraging reminder to continue doing my best each day. How does your work support CoreCivic's reentry mission? At CoreCivic, we strive to set residents up for a successful reentry. For example, we help residents find gainful employment so they leave the facility with a sense of confidence, knowing that something greater is ahead. We want residents to transition back into the community and never come back.